From learning Korean culture to speaking some of the language, Indiana State University's Early Childhood Education Forum gives current and future teachers continued professional development in cultural diversity. 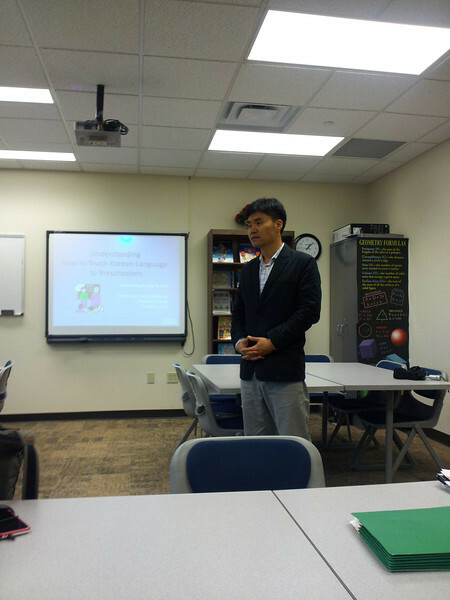 The forum this semester features the Korean teacher in education, said Yong Joon Park, assistant professor in the department of elementary, early and special education. In attending the forums individuals will learn how to play the guitar for Korean children's songs as well as the characteristics of teaching and parenting in South Korea. The forum is for Indiana State students with an interest in the early childhood minor as well as caregivers, daycare teachers, preschool teachers, primary grade level teachers, professors, administrators, staff and teacher candidates. The forum meets on Fridays through Nov. 30 from 1 p.m. to 2 p.m. and is located at the Center for Mathematics Education in room 217A at University Hall. Registration for the forum is free and is sponsored by the Richard Willey Memorial Faculty Development Fund 2012. Park explained that the Early Childhood Education Forum was created to enhance the understanding of diverse communities through the lens of early childhood education. "The forum will expand cultural diversity in early childhood education centers and school districts throughout Indiana, other states and the world," Park said. Those attending the forum will share knowledge of cultural diversity, watch artistic performances and help potential teacher candidates. Eunice Yuju, a doctoral student in the department of curriculum instruction, specializing in early childhood education, described some of the activities at the Terre Haute Korean School. "In our class we talk about the vowels and consonants, we read stories. Another part of the class is a group activity. They have a field trip to Rose Hulman where they watch the stars," she said. Cultural differences will be topics chosen to discuss as well as how children learn and the Korean educational system. "We can talk about what is very popular here now, like Gangnam Style," said Yuju. "In Asian culture attitude is very important, whoever your teacher, you have to honor them and respect him or her. Family value and country is also to be honored." Students learn respect and participate in activities to gain knowledge on cultural diversity. "We believe kids learn through senses plus one, hearing, smell, taste, touch and heart; the heart is where we talk about attitude," Yuju said. Park said that the education forum is scheduled to be held in the spring semester and will focus on Taiwanese culture. Photo: http://isuphoto.smugmug.com/photos/i-xS3ZpMS/0/L/i-xS3ZpMS-L.jpgYong Joon Park lectures during the forum. From learning Korean culture to speaking some of the language, Indiana State Universityâ€™s Early Childhood Education Forum gives current and future teachers continued professional development in cultural diversity.